The island of Sicily, located just to the west of Calabria (the “tip” of Italy’s boot) might not be the southernmost point in Italy (that award goes to the island of Lampedusa), but it’s pretty far south, and it is home to the two southernmost DOCs of Italy (they overlap, and it’s a tie): the Eloro DOC and the Noto DOC. First things first: about that “southernmost” claim: the southernmost town (commune) I could find (via Google maps) located within the Eloro DOC and Noto DOCs is Portopalo di Capo Passero (which is itself located within the Province of Syracuse). Its latitude is 36° 41′N. For the record, that’s just a little bit farther south than the DOC of Pantelleria, which is often quoted as Italy’s southernmost DOC, yet sits at 36° 50′. The land around these two DOCs is mostly a flat, coastal plain so the area can become quite warm. Only the northernmost reaches of the Noto DOC has any hills to speak of, but the breezes off the Mediterranean Sea provide a necessary cooling influence. 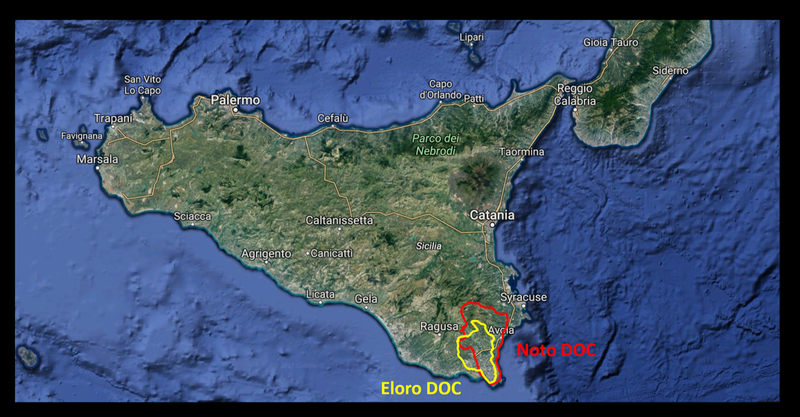 The Eloro DOC is named after Helorus (Italian: Eloro), an archeological site located in the modern-day commune of Noto. 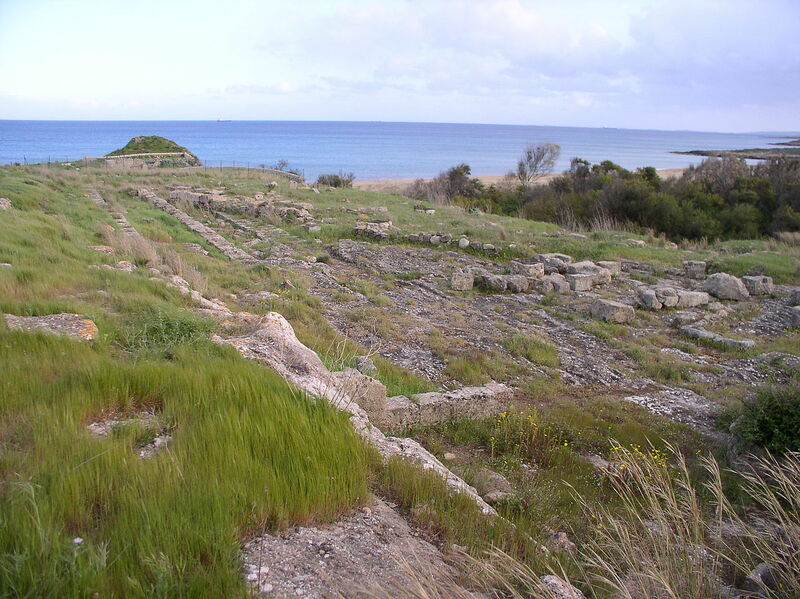 Helorus was an ancient Greek (then Roman) city dating from late 8th century BC. Helorus was mentioned by Thucydides in his recounting the retreat of the Athenians “on the road leading to Helorus from Syracuse.” The once-fortified city had a theater (called the colisseo) and many buildings. Today, parts of the city’s foundations, some portions of the outer walls, and a single column atop a square pedestal are still intact. Red and rosé wines are produced under the Eloro DOC. Both styles are produced using a minimum of 90% Nero d’Avola, Frappato, and Pignatello grapes; the other 10% is allowed to include any red grape approved for Sicily. Red wines only are produced in the subzone of Pachino, and must be a minimum of 80% Nero d’Avola, with the other 20% being % Frappato and/or Pignatello. The emphasis on Nero d’Avola makes sense as likely native home of the grape–the commune of Avola–is just a few miles away. The Eloro DOC was established in 1994. Noto DOC is a new name for the area formerly known as the Moscato di Noto DOC, and a good deal of Moscato-based wine is still produced here. However, under the new title, red wines are produced as well. Among the many styles of Moscato di Noto (all made with 100% Moscato Bianco) are a varietal Moscato, a spumante, a liquoroso (fortified), and a dried-grape version known as Passito di Noto. The Moscato di Noto spumante is required to have at least 5% residual sugar and a minimum of 4 atm of pressure. The liquoroso (fortified) must be fermented to at least 6.5% abv before fortification takes place. The Noto DOC also produces a rosso made with a required minimum of 65% Nero d’Avloa, as well as a varietal Nero d’Avola (with the typical 85% minimum requirement). 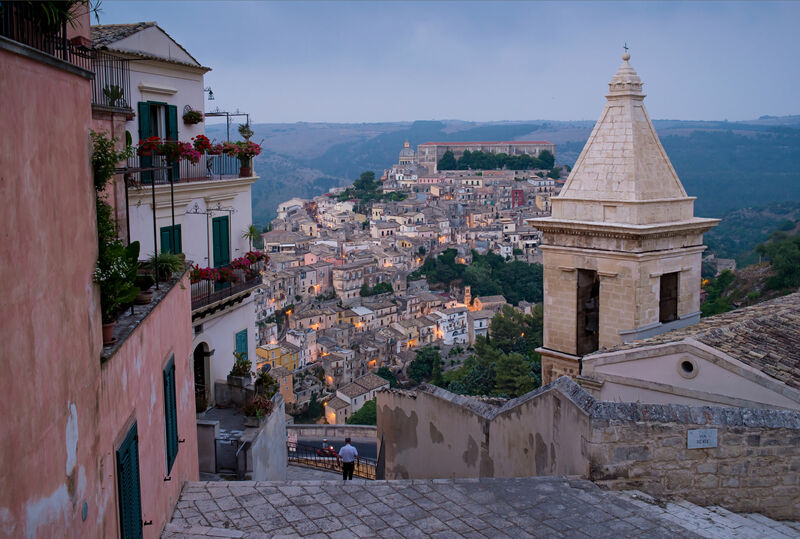 The area around the town of Noto was destroyed in an earthquake in 1693, so the town that one may visit today dates to the early 18th century. Many of the churches, walkways and buildings were designed by the Sicilian architect Rosario Gagliardi (1698–1762) who worked in what is now known as the Sicilian Baroque style. Among the most amazing sites of the town are Corso Vittorio Emanuele, a street which includes the Church of San Domenico, and the Fountain of Hercules. 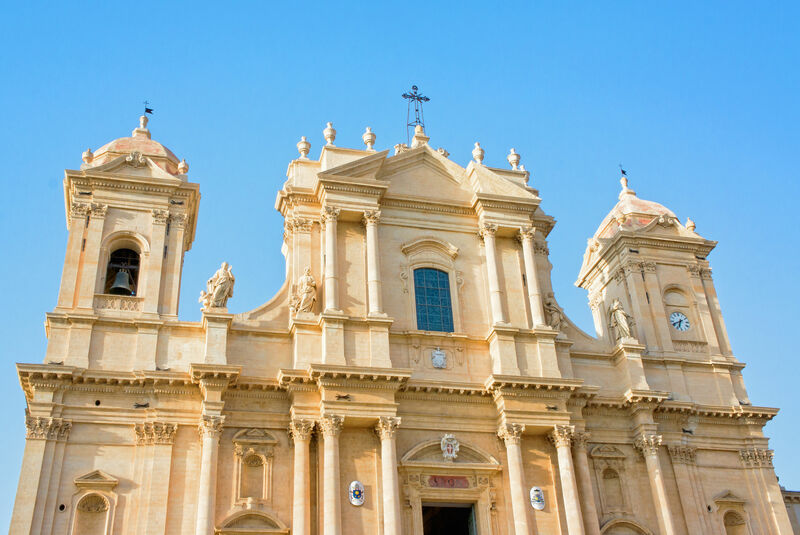 Noto is a UNESCO World Heritage Site. As for the other extreme, it looks like the northernmost DOC in Italy is the Alto Adige DOC, which just barely nudges out the DOC of Valdadige – both are reaching up to 46° 40′N latitude. More on that later! Johnson, H., & Robinson, J. (2013). The World Atlas of Wine (Seventh edition). London: Mitchell Beazely. Thanks for this.Am taking a wander to Sicily this year for some research and relaxation. This gets me started.